At MOGAS we believe that a strong organizational culture and innovation are crucial to perfomance and success. We maximize our motivation through cherishing our work, knowing the purpose why we work and the benefits we reap from executing our tasks well. To be a leading brand of choice in markets we operate. To deliver world-class products and services to a diverse clientele, with solutions that add value to our business, stakeholders and environment. Founded in 1987 Maestro Oil & Gas Solutions (MOGAS) is an integrated regional downstream oil marketing company with business operations ranging from international oil trading to marine and inland terminals, retail networks, and lubrication services. MOGAS has strongly positioned itself as the leading brand name for fuels, oil and lubricants in East & Central Africa with operations in Uganda, Kenya, Tanzania, Rwanda, Burundi, the Democratic Republic of Congo and the UAE. The company’s core operating assets include state of the art marine terminals at the port of Dar es Salaam with a capacity of 40,000m3 and Port of Tanga with a of capacity 6,500m3 ; a modern inland fuel depots with a capacity of 5,000 m3 in Kampala; and in Lubumbashi, DRC with a capacity of 5,000m3 capacity. 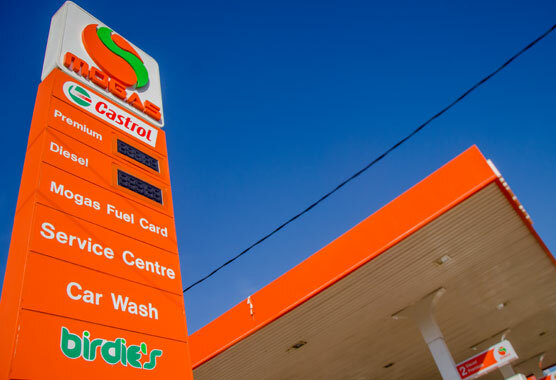 MOGAS is the sole distributor for Castrol in Uganda and Rwanda: its specialty line of business also includes technology led and premium quality MOGAS oils and lubricants; bituminous products; penetration grades;cutbacks and emulsions; LPG and fuel oil. MOGAS offers an extensive range of automotive lubricants and industrial fluids. Mr Rugazoora has 26 years of experience in the petroleum downstream segment. For the past seven years he has devoted all his energies and passion to growing the MOGAS business in East and Central Africa. Under his leadership, MOGAS GROUP has grown rapidly, entered new markets and diversified its products to become established as one of the region’s most dynamic downstream oil companies. Geoffrey also sits on the committee for Uganda Fuel Supply Coordination under the Ministry of Energy & Mineral Development. With nearly two decades of ICT practice in the commercial and industrial sector behind him, Mr Reddy oversees the platforms and systems that are part of our business infrastructure including the group-wide implementation of Oracle ERP System. Ronald is a seasoned sales and marketing professional with over 10 years work experience in Uganda and Rwanda. He is currently our Country Manager in Rwanda, very determined to grow MOGAS business activity and visibility. Ashish is MD of the rapidly growing MOGAS Tanzania, based in Dar es Salaam. He was appointed following 20 years in finance management roles. Previously he had been MD of MOGAS Kenya. For the past 15 years, Joseph Abilla Ogwang a trained HR specialist, has managed HR functions in reputable companies including AIDS Healthcare Foundation (AHF) as the Africa Regional HR Manager -2012-2015, Head of Human Resources at Orient Bank Limited (2015-2017), and Regional HR Consultant / Business Partner with Stanbic Bank Uganda (2007-2011) among other. •Bachelor’s Degree in Social Work and Social Administration. Also trained in industrial chemistry, Mercy is MOGAS Group’s Health, Safety, Environment and Standards Manager, a role to which she brings over 10 years of working in safety and quality standards compliance. An industrial chemist with more than 16 years experience of technical and commercial sales,market development and training, John is our Specialties Product Development Co-ordinator, also currently engaged in MOGAS brand revamping project.